Post written by Erin Sato, Assistant Archivist at Go For Broke National Education Center. A single devastating event could change everything in an instant. On December 7, 1941, the bombing of Pearl Harbor in Honolulu, Hawaii by the Japanese Imperial Army changed the lives of thousands of Japanese Americans forever. Photo courtesy of the National Archives and Records Administration. This response towards Japanese Americans resonated throughout the entire nation. What manifested from this wartime hysteria was President Roosevelt’s authorization and implementation of Executive Order 9066, which allowed for the forced removal and incarceration of 120,000 Japanese Americans living on the West Coast. In addition, due to fear of sabotage, the government reclassified all Japanese Americans who were eligible for the wartime draft from 1A (available for military service) to 4C (enemy alien). However, this did not stop the Nisei from proving their loyalty and volunteering to enlist into the United States Army. Some Nisei went through extreme lengths to volunteer. Tsuneo “Cappy” Harada mentions in his oral history interview, how he hitchhiked 35 miles from his junior college to Camp San Luis Obispo to enlist. Those living in Hawaii at the time of the attack endured a different course of events that contrasted the experience of their counterparts living on the Mainland. For instance, all soldiers of Japanese ancestry who were serving in the Hawaii Territorial Guard were disarmed and discharged from service. Undeterred, this did not stop them from volunteering their services towards the war effort. Men of the VVV constructing an army barrack. Photo courtesy of Ted Tsukiyama. By gathering a number of volunteers, this group was formed into the Varsity Victory Volunteers (VVV), which was attached to the 34th Engineer Battalion. As a civilian labor battalion, the VVV worked hard to construct roads, build barracks and water towers–contributing any type of labor work to help. The dedication and hard work conveyed by the VVV led to the creation of the 442nd Regimental Combat Team. The bombing of Pearl Harbor on December 7th, 1941 changed the lives of the entire Japanese American population in the United States. The situation that the Nisei were put into forced them to take a course of action; instead of letting the response of the American public hold them back, they focused on reaffirming their American identity by offering their services and sacrificing their lives to fight for the country that doubted their loyalty. It is this type of patriotism and willingness to “Go for Broke” that made the 100th Infantry Battalion (Separate) and the 442nd Regimental Combat Team the most highly decorated military unit in United States military history. Photo courtesy of the U.S. Army Signal Corps. CSULA students make class presentations at Go For Broke National Education Center. California State University, Los Angeles Cultural Anthropology 3600-01 students, led by Professor James Sera, conducted research in the National Digital Archives Japanese American Military Service to create comparative analyses of the experiences of Japanese Americans after Japan’s attack on Pearl Harbor on December 7, 1941 and of Muslim Americans after the terrorist attacks on September 11, 2001. Go For Broke archives staff welcomed forty students into the archives, each of whom worked in groups to create a website exhibit with items from the archives and other sources. On December 1, 2016, the students presented their findings to Go For Broke staff. Go For Broke archives staff express their thanks and reflect on the experience of sharing the archives with the students. Learning history can be boring. Textbooks can be dry; memorization of dates, important figures and events can be daunting. What makes these facts and figures mean something to you? When I think about history and events, I look for personal stories, because when I hear a personal story, I am emotionally and intellectually engaged. This leaves an impression on me. Summer Espinoza helping CSULA students conduct research within the GFBNEC archives. Japanese American veterans’ personal experiences so that students are engaged with video content–with the personal stories. Yesterday, students showed thoughtful engagement. 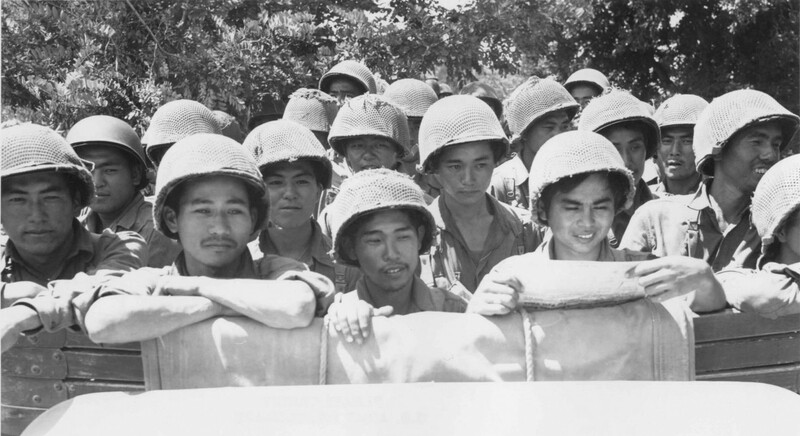 They recalled the personal stories of the Nisei soldier videos at Go For Broke and they located other digital sources of both Japanese American and Muslim American narratives, investigating public policy written in response to these events and displayed maturity of thought and growth in how history in the first-person narrative can be a teaching tool. I am at work this morning and it is a great experience, even though I am sick. There are eight students sitting near me who are doing research in the database we are creating. They are in a class that is comparing Muslim American experiences with Japanese American experiences in the United States… it [also] gives me personal satisfaction because I had always wanted to do work where I learn and where I feel like I am directly affecting people. In my job, I really feel like I am doing something that is both powerful and that allows me to do it quietly. I feel like a “silent activist” and being an archivist and an activist is something of a dream for me. Thank you to the entire Cultural Anthropology 3600-01 class for your hard work this semester! As I made my way to the presentation area and the groups began their presentations, I could sense a good deal of nervous energy in the room, from the students, GFB staff, and their professor. We all knew that the students had put in a good deal of time and effort into their work, but conveying information in a clear and articulate manner to an audience is a separate challenge in and of itself. The student groups, one by one, discussed the conclusions that they reached by researching statistics, news stories, photographs, and oral history interviews related to Japanese Americans and Muslim Americans. A student group presents their findings. Much of their content was similar and overlapped, which was to be expected. Their topic of research was one that had a somewhat expected outcome in terms of the tone of the content. Yet, my eventual take away from their presentations was that the fruit of their research was the secondary prize for us (their research institution). The most gratifying aspect, in my opinion, was realizing that these students had performed their own research using our collections and had come to their own conclusions by way of that process. A few of them admitted during and after their presentations that prior to this course, they were not overly familiar with the story of the Japanese American experience during World War II. Even fewer of them knew about the feats of the Nisei veterans who served. The fact that Go For Broke was able to use our archives to positively impact students, even on a small scale, was both gratifying and encouraging for the future. With our push to become an organization with a national presence that can affect change by enhancing education through curriculum and general awareness of the Nisei Veteran story, small steps like this one can be significant stepping stones. Years later, I hope that I can look back at moments like this one and cite it as a time where I helped play a tiny role in telling the story of an underrepresented and underappreciated group of people. That is the goal of archives, and I am glad to work daily in pursuit of that goal. After many weeks of observing these CSULA students work and research within the GFBNEC archives, I was excited to see what each group had compiled for their class presentations. Because I am not a huge fan of making presentations, I understood how these students were feeling standing in front of their class, teacher, and the entire GFBNEC staff with their nerves getting the best of them. Students present their Omeka webpage. American population after the bombing of Pearl Harbor, and the treatment towards Muslim Americans after the terrorist attack on 9/11. They found that both ethnic groups were targets of discrimination based solely on the fact that each group resembled the enemy who had conducted the attacks, and these feelings were ultimately fueled by fear and war hysteria. Being a part of the GFBNEC archives staff, it was refreshing to see what these students were able to compile for their presentations based off of the work that we have done here. It made me extremely happy to see that the students were able to utilize information from our archives and use it to create their own perspectives and conclusions about the Nisei experience during World War II and relate it to present day events.